- 5+ years of hands on experience in developing & maintaining end to end (record to report) solutions using Hyperion Essbase. - Troubleshoot Essbase related issues in the existing environments. - In-depth knowledge of the causes and remedies of performance issues within the Hyperion environment. 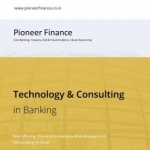 HR at Pioneer Financial & Management Services Ltd.